D.C. Labs, nationwide provider of the luxurious Ovation Cell Therapy® Hair & Scalp Treatment, starts the holiday season by bringing cheer! 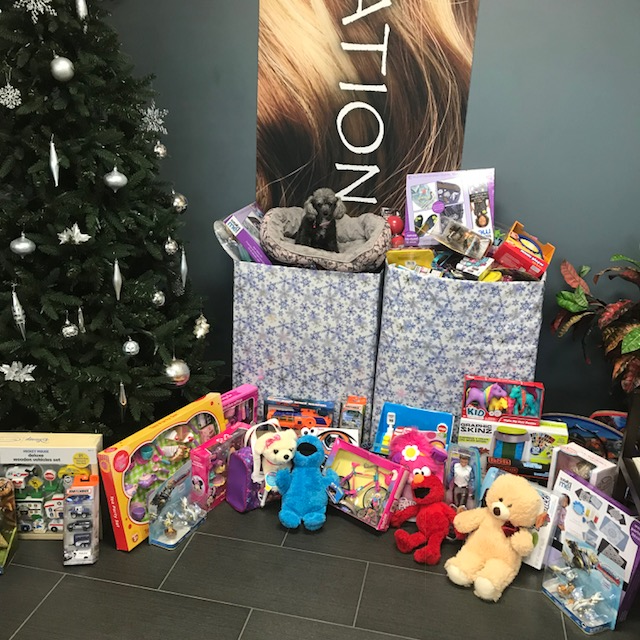 The annual toy drive marks the eighth year in a row Ovation Hair has participated in providing corporate donations to the charitable program. Ovation Hair’s in the holiday spirit by sponsoring their local Toys for Tots program. From November through mid-December, Ovation Hair has been accepting new unwrapped toy donations to be distributed throughout their local community to children less fortunate. The Ovation team is very generous donating over 100 toys to the organization. Since 1947, the U.S. Marine Corps Reserve Toys for Tots® Program has carried out their mission to collect new, unwrapped toys during October, November and December each year, and distribute those toys as Christmas gifts to less fortunate children in the community in which the campaign is conducted. The books, toys and other gifts collected and distributed by the Marines offer these children a message of hope to help these youngsters become responsible, productive citizens and caring members of their community. For more information, visit http://www.toysfortots.org.